Mary Ann Anstey (1763-1829), Eldest daughter of Christopher Anstey. Sitter associated with 1 portrait. 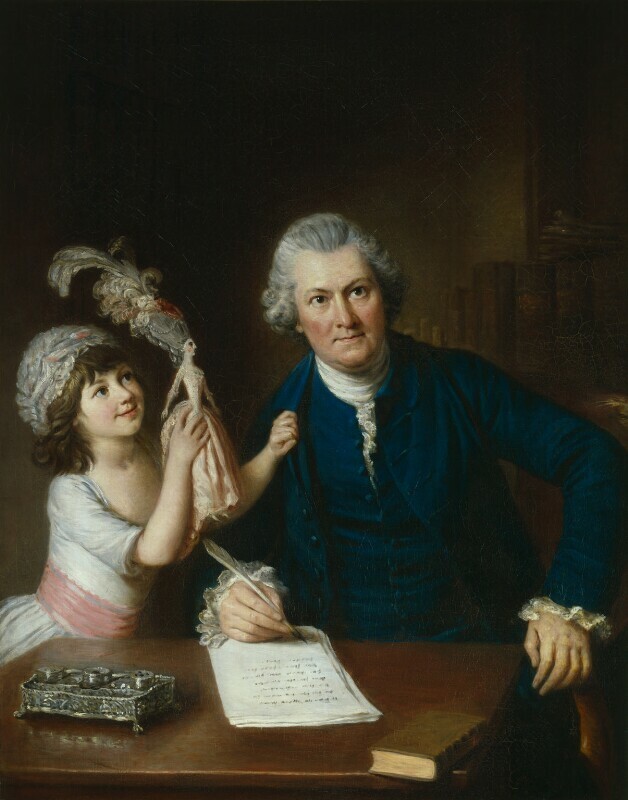 He is shown here with one of his four daughters who playfully tries to distract him from his work. Her toy is actually a fashion doll like those sent from Paris to guide dressmakers in the latest styles. Its towering feathered hair-style is clearly meant to recall Anstey's satire of such extremes of modern female fashion. Act of Parliament extends inventor James Watt's patent (first granted in 1769) and the first steam engines are built under it. First known building society - Ketley's Building Society - is established in Birmingham by Richard Ketley, landlord of the Golden Cross Inn. First performance of Richard Brinsley Sheridan's play The Rivals at the Covent Garden Theatre in London. Artist J.M.W. Turner is born. Satirist James Gillray's first engravings and etchings are published. Navigator Captain Cook publishes his discovery of a preventive cure against scurvy, in the form of a regular ration of lemon juice. War of American Independence begins with British defeat at Lexington and Concord and lasts until 1783. British achieve a narrow and costly victory over the Americans at the Battle of Bunker Hill. Edmund Burke delivers a speech to the British Parliament on conciliation with the American colonies. First performance of Pierre Beaumarchais' comic opera The Barber of Seville in Paris. Pope Pius VI succeeds Pope Clement XIV as the 251st pope.